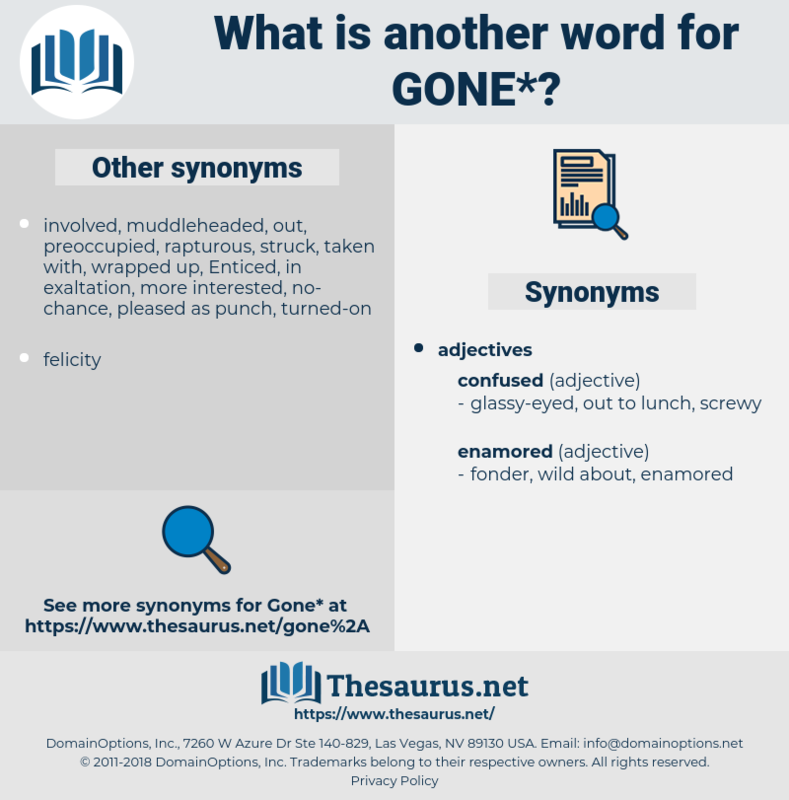 What is another word for gone? 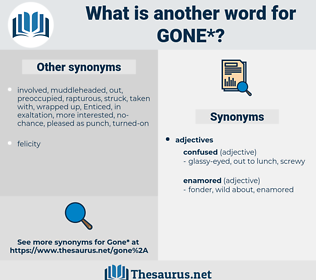 Participated, where, Commencing, departed, involved, collapsed, travelled, sent, Belonged, used, Arrived, joined, Acceded, included, represented, retired, Sailed, started, ratified, enrolled, Walked, derived, ditch, Bailed, faded, Served, based, Took, leave, come. goodbye, governed, Undergone, Progressed, Negotiated, redesignated, hung, evaporated, forgotten, Forgot, acknowledged, Participated, abandoned, endangered, withdrawn, Attributed, suggested, supported, accompanied, grown, incorporated, Forwarded, discontinued, Ceased, prolonged, overwhelmed, allocated, fucked, characterized, Investigated, disconnected, encouraged, dreambecame, bypassed, Caught, Overtaken, obliterated, Abrogated, exterminated, where, Mentioned, Consented, Worked, transitioned, Followed, deactivated, relocated, ignored, departure, Deployed, Excluded, recovered, repatriated, redeployed, removed, Operated, escalated, continued, triggered, concluded, dispatched, Eliminated, overlooked, Forgiven, Perpetrated, Seconded, characterised, increased, guarded, implemented, obliged, complemented, terminated, surrendered, associated, accelerated, transformed, Liquidated, integrated, Existed, Experimented, squandered, Transcended, organized, forged, involved, observed, destroyed, recorded, concerned, Occurred, passage, evacuated, Slaughtered, Embarked, pointed, Displaced, recognized, Transferred, converted, Begun, Culminated, outdated, Generated, motivated, hurried, revolved, Prosecuted, dissolved, opted, decreased, pledged, committed, registered, designated, zero, approved, Borrowed, overcome, collapsed, scattered, endorsed, dissipated, Explored, Detonated, intensified, Outstripped, alleged, functioned, overthrown, exploded, Evolved, Withstood, Contributed, disclosed, sustained, initiated, travel, traveled, Transpired, contracted, Contended, shot, Migrated, subscribed, Dragged, renumbered, Reverted, eroded, Surpassed, documented, Transported, Encountered, travelled, sent, cancelled, devastated, buggered, Consulted, restored, imprisoned, cost, activated, renowned, engaged, Constructed, HIT, stretched, Administered, diminished, Outlived, presented, conducted, minute, Emerged, Supplemented, extinguished, contacted, Succumbed, Pooped, changed, Responded, Eradicated, clobbered, Scrolled, thrown, distance, appreciated, donated, Stayed, used, labeled, labelled, devoted, agreed, offset, Performed, Switched, Ranged, addressed, collected, demolished, consumed, extended, affected, oriented, Vacated, Climbed, assigned, forfeited, Convened, regulated, escaped, exploited, threatened, considered, expended, unshackled, resolved, advanced, Betrayed, Prompted, declared, graduated, Arrived, Managed, Declined, touched, resettled, Channelled, endeavoured, supposed, upgraded, Omitted, L, Stationed, Delivered, Earmarked, dismissed, distributed, joined, reported, experienced, suspended, maintained, Enjoyed, contained, Targeted, appointed, stolen, disposed, become, Undertaken, Compromised, Entered, expanded, arranged, compelled, Inserted, checked, understood, Approached, transmitted, located, Heightened, calibrated, Befallen, accomplished, Remained, Frequented, developed, !, diverted, Visited, sparked, spent, settled, Urged, shattered, finalized, determined, Introduced, Retrieved, ended, Scored, tagged, Robbed, utilized, Issued, granted, Resumed, signed, Complied, cooked, detached, Tommy, witnessed, Referred, Enshrined, accessed, expressed, released, confused, Looked, Obtained, Brought, driven, Insisted, discharged, chosen, resigned, altered, featured, clocked, executed, Lagged, invested, route, routed, misplaced, facilitated, turn, turned, focused, dedicated, Suffered, Flown, overrun, upset, headed, Revoked, Deleted, Deleting, Absconded, absorbed, employed, Judged, Explained, Traversed, Abolished, Submitted, Subsided, Stumbled, improved, Assuaged, Acceded, Comprised, separated, Benefited, benefitted, Harvested, given, simon, pressured, resident, blown, Shifted, Allowed, Fought, Fled, Deported, Extracted, Plunged, shrunk, Argued, Filed, breached, worried, formulated, Prevailed, follow-up, covered, pronounced, dismantled, Disbanded, positioned, included, ', monitored, received, broken, Avoided, effected, represented, auctioned, alleviated, Captured, specified, reviewed, tempered, unleashed, crossed, honoured, classified, Erased, secured, doomed, Recruited, inputted, directed, deducted, risen, Perished, input, Drafted, deserted, written, allotted, voiced, Endured, Anything, matured, realised, IOST, Procured, void, attended, Repealed, Reached, road, Rendered, retired, run, exited, Happened, Exceeded, owed, reversed, ridden, Gotten, Got, rescued, produced, stoned, Charted, Deceived, bolted, Incurred, Ascended, fuddled, depleted, limited, Offered, engulfed, saved, pursued, Adhered, stuck, Embraced, unheeded, set, required, destined, boned, closed, adopted, Ousted, torched, permitted, processed, published, enhanced, analyzed, deprived, buddy, kidnapped, noticed, started, Appealed, realized, embodied, Waived, Launched, retained, defeated, lifted, seized, Screwed, surmounted, solved, spread, exhausted, ensured, abducted, Steered, designed, Housed, played, put, severed, assaulted, Appeared, assembled, Watched, Jumped, letter, arrested, guided, Picked, admitted, stressed, Pushed, reflected, swept, Achieved, intended, Resulted, HOSED, strained, faced, Toppled, dashed, inverted, combusted, Installed, fulfilled, expired, held, Attracted, decided, totaled, sat, Fainted, divided, murdered, Expunged, ratified, Spared, Provided, hurt, Excreted, lowered, Exercised, Examined, Averted, struck, replaced, sunk, Resided, Resorted, selected, loaded, deferred, crushed, tracked, attained, called, credited, stranded, asserted, loved, spoken, renamed, Soared, Told, Expelled, Evaded, unplugged, Bon, Tackled, licensed, forced, Purged, assumed, Discussed, Carried, return, Returned, Enabled, reacted, dropped, scared, Voted, Evicted, analysed, filmed, Tripped, Dispelled, Yielded, Relied, Devised, mounted, handled, smashed, reduced, known, missed, attached, renewed, rushed, Answered, slain, Demanded, Detained, charged, Shown, established, sacked, walter, bet, Enacted, Counted, tailed, derived, accepted, Awarded, trapped, blocked, Wiped, elapsed, step, Stepped, Succeeded, lent, cracked, tapped, felt, chased, embedded, vented, shut, Subjected, Attacked, proved, proven, biased, Slowed, Staked, drawn, hired, printed, Spurred, tested, Debated, Accorded, amp, cursed, landed, Gained, Crashed, varied, situated, Exerted, Leaked, ruled, studied, Snapped, placed, Viewed, maybe, FARTED, marked, healed, Sued, handed, Tempted, Shied, reunited, beaten, rectified, Abated, buried, Allayed, posted, Passed, lf, led, bound, lapsed, Been, remembered, wasted, worn, kept, Marketed, burned, burnt, Reaped, Replied, Remitted, pull, pulled, Shipped, edited, Quashed, team, paid, faded, Termed, Caused, Denied, laid, Helped, busted, Lasted, empty, filled, Lacked, seen, tied, rid, said, applied, elected, ruined, Claimed, Arisen, Served, wired, traded, requested, Aimed, baked, halted, built, assisted, unfurled, found, fused, ripped, cleared, vested, Availed, controlled, always, cured, ben, attempted, live, Lived, earned, learned, Learnt, failed, treated, read, listed, linked, Asked, fresh, raised, adjusted, very, fixed, Talked, suited, sought, pal, tired, Fitted, Cited, Created, geared, liked, Borne, hunted, \, Tended, Spun, canned, Dammed, backed, aided, tabled, nil, Stood, have, Had, Has, Dealt, eased, stated, heard, y, Met, nuts, jammed, won, fire, fired, firing, trained, Acted, melted, Meant, taken, tried, based, ii, formed, acquired, li, damned, dated, al, 'il, named, shed, not, made, Him, leave, come. participates, Leaves, contributes, belongs, includes, falls, kills, serves, Dies. saved, existing, around, present, incomplete, unfinished, sufficient, alive, stored, living, working, current, Hoarded, found. quick, execrable, animated, low-grade, Miscarrying, awful, vivacious, preserved, running, retained, owned, cherished, aborting, lively, loved, substandard, going, operative, terrible, second-rate, mediocre, active, unsatisfactory, Prized, lousy, thriving, vibrant, inferior, infertile, poor, wretched, vile, possessed, nonpregnant, treasured, middling, barren, functioning, protected, rotten, bad, future, pathetic, dynamic, vital, atrocious, valued. Would we have gone back if we could? genu, goujon, guaiacum, gizmo, ghana, go home, gown, gamin, gas gun, ganoine, gnomon, gascogne, go game, gunman, ghanaian, gun, genome, gooney, gnome, gwyn, gasman, ghanian, goon, gay woman, game, gumma, Genie, gascony, gamey, gammy, Gam, Goma, guam, gismo, gen, guanine, g-man, gamy, gain, gum, geum, guinea hen, gemini, gnaw, gawne, goony, gonne, gin, gemma, guinean, gamma, genoa, go on, gnu, gauguin, gm, guano, guinea, gammon, gagman, gonion, gummy, guama, guiana, gum anime, gene, goonie, guenon, genuine, guyana, gas main, gean, gaussian, gynne, gwynn, gawain, gywn, gem, guggenheim, gym, go in, gunny, gehenna, gaskin, goose skin, gamine, gamow, gazania, guan, gay man, ganoin.